Faithpreneur is a step-by-step guide designed to help you find and act upon your God-given purpose in life. This is your resource to creating the life of entrepreneurship you have always dreamed of living. 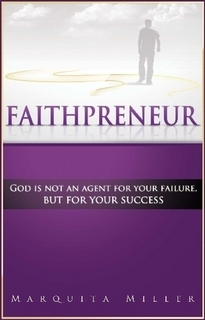 Follow author and entrepreneur Marquita Miller through 12, faith-based steps to success, and discover God’s purpose for you through a unique blend of faith and the key principles of entrepreneurship. Each step to success has its own chapter, complete with inspiring quotes from the Bible, a personal prayer for each element of the journey and exercise sheets designed to help you determine your God-given purpose. The book also includes resource guides, forms and checklists crucial to business formation and success stories from fellow entrepreneurs who know the challenges of beginning a small business. This book is your road map to success—use it as a teaching tool, a guide or simply as an inspiration. And remember, God helps those who help themselves. Many opt to set up their business themselves and obtain the identification number without knowing the responsibility that comes with the number. Copyright © 2011-2017 Faithpreneur, All Rights Reserved.